Click image to download the printed program. Stetson University’s Center for Community Engagement (CCE) plays the lead institutional role in directing a nationally recognized campus-wide community engagement program that is delivered through both curricular and co-curricular avenues. Below we share presentations delivered at the gathering. 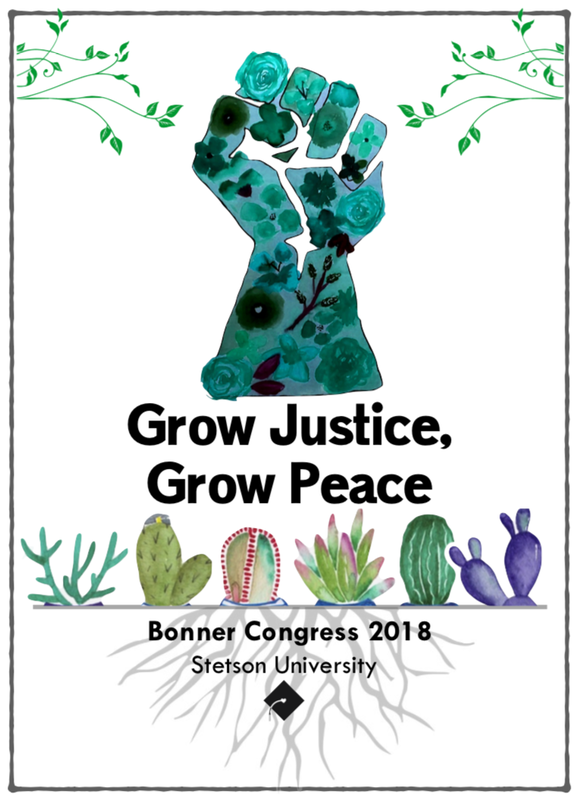 We kickstarted Bonner Congress 2018 and began a weekend dedicated to growing justice and growing peace by learning about DeLand, Stetson, and the Bonner network from Lynn Schoenberg, Dean of Students, Center for Community Engagement students and staff, student keynote speakers, and Bonner Foundation President, Bobby Hackett. Come learn how capacity building has taken root with local community partners of DeLand and the student leaders and staff involved in the growth. Join the conversation by sharing your own experiences with capacity building in our interactive fishbowl activity. In this all-group session, students will delve into the concept of Bonner Capstones. Students will have a chance to hear from several peers who are engaged in integrating significant capacity building capstone projects into their own individual work or Bonner Programs more broadly. Students will learn about how this work is part of larger efforts to promote campus and community change! Food banks? D.A.R.E.? Habitat for Humanity? With many organizations and strategies trying to address complex social problems, how do we determine which ones actually make an impact? This strategic track session is a condensed training from the new 8 Themes Curriculum. Through interactive activities, we will explore how to measure and determine the effectiveness of an organization or strategy. We will grapple with “band-aid” solutions and practice root cause analysis. Limited to 30 participants. Today we are often expected to simultaneously work on multiple tasks independently and as a member of a team. This requires project management skills that are often not taught in a classroom. This session unpacks the bare bones of project management as part of the new 8 Themes Curriculum. Through an interactive board game, participants will gain an overall understanding about project management processes and be introduced to a number of tools that support the planning, implementation, and conclusion of projects regardless of its’ size, discipline, or importance. Limited to 30 participants. This session seeks to instruct and train students who want to further engage their service with policy-oriented solutions. This session will cover the ways students can begin to seek impactful evidence-based practices to inform the policies that lead to social change. Students will participate in a condensed training based off of the Know Your Issue Modules within in the new 8 Themes Curriculum for Bonners. The Know Your Issue Modules provide students the skillset and contextual knowledge to be thoroughly aware of the purpose of their service, how it can be done better, how it can lead to sustained impact, and what their role is in the overall process. Limited to 30 participants. This workshop will engage students in learning more about the nonprofit, for-profit, and public sectors in an engaging way. Students will be acquainted with the definitions and key characteristics of these sectors, as well as some of the ways that organizations now create income and revenue strategies that blur the definitions. This session is also a preview of pieces the new 8 Themes Curriculum, which helps students build organizational capacity while also preparing them for meaningful projects and future career interests. Through fun, interactive activities, students will also get a chance to learn from each other and from the profiles of Bonner Alumni who have gone on to various careers. Through reflection and group dialogue, students will apply what they learn to consider their own future career interests and how they might leverage their Bonner experiences and values through careers in these sectors. Limited to 30 participants. It can be a daunting task to initiate complex social justice initiatives such as constructing a higher education in prison program. This workshop will provide practical advice for building a program that emphasizes development of horizontal leadership within the organization and work with multiple stakeholders and communities. We will discuss these topics in relation to common challenges to this work including measured program growth, recruitment of reliable volunteers, financial constraints, and creation of the requisite "buy-in" from diverse and sometimes competing constituencies. This workshop is designed as a series of simulation games, discussions and reflection on understanding cross-cultural conflicts in activism/community service. It will be shaped by the participants' navigation of issues surrounding cultural relativism, power-privilege biases and looking at the world through a different lens. The aim will be to challenge participants to think how their preconceived notions and western understanding of justice and peace could create problems when working with people from different cultures. The Young Adult Volunteer (YAV) program is an ecumenical, faith-based year of service for young people, ages 19-30. Partners around the world and across the United States invite volunteers to accompany local agencies working to address root causes of poverty and reconciliation. This year of service and accompaniment challenges young people to reimagine ideas of service to a responsibility to engage with complicity and perpetuation of unjust social arrangements while exploring the meaning and motivation of their faith. Come and learn more! Learn how to build your best set of skills and tool box when it comes to working with children from disadvantaged situations. Hear from a community partner with 18 plus years of experience working with kids from the local Boys & Girls Club. Discuss best practices and best approaches when working with the youth ages 6 to 18. Learn how to set goals, how to set boundaries, how to encourage, and how to redirect negative attitudes without judging the children. By creating projects rooted in research and committing to the on-going process of impact evaluation, UH Bonners develop transferable academic and professional skills while providing high-quality and impactful service. This workshop describes how UH Bonners create, sustain, and analyze our service projects. Additionally, we will present resources and brainstorm methods of adapting the ideas of research, measurement, and evaluation for other Bonner chapters’ projects. In this workshop, especially targeted for Senior Interns or student leaders who play a role in crafting their Bonner Program’s meeting and training calendar, we will talk about the Bonner Capstone Project in more depth. You will learn about the 8-part series of workshops designed with the leadership of National Bonner Interns to support integration of capstones. You will have a chance to engage in activities that help students connect their academic studies and Bonner service experiences through hands-on projects. Additionally, we will talk on a broader level about strategies that are effective for students to get their Bonner Programs more connected with faculty, coursework, and academic experience in general. Did you know your service work is also valuable professional experience? Learn how to identify, convey and leverage your experience to help you bridge the gap from college to career. This session will offer tips for identifying and conveying your unique skills to employers through your application and in interviews. Also included is how to leverage those opportunities you secure through tools like informational interviews, so that you can build upon your experiences and continue to expand your professional network. The Congressional Hunger Center will showcase the past year of partnership with the Bonner Foundation, update students on new opportunities to become involved with anti-hunger advocacy efforts, and conduct a demonstration of our newly re-launched tool: Zero Hunger Academy. CHC will also discuss the pilot summer of the Zero Hunger Internship Program and progress with the Zero Hunger Campus Network. Bonner Student Leadership continues to be an integral backbone to the success of any Bonner Program and the local communities in which we serve. Leadership Teams can vary across the Network in size, shape, or responsibilities, but all serve a collective purpose: to promote the community change we wish to see. This workshop will provide participants with the ability to self-assess their BLT and discover methods of possible future improvement. The purpose of this workshop is to share and discuss how Wofford’s Bonner Leadership Team develops our annual sophomore exchange. Our goal is to not only establish meaningful relationships with our fellow Bonners, but gain a better understanding of how diverse and impactful Bonner is for each individual and their school. We emphasize self and civic identity, community and social awareness, networking, skill development, individual and collective experiences and perspectives, but most importantly creating new memories and having fun! An anniversary celebration that includes both current Bonners and Alumni may seem a daunting task. This was exactly our challenge. Our Bonner program is 10 years old (just this September), and we wanted to pull together a, "tenniversary." How did we do? For the most part, great! How did we do it? This workshop aims to break down the steps to a successful celebration, some of the difficulties encountered, and how to better the celebration. Our experience will be useful -- especially for programs that are hitting large milestones. This workshop will take students on a trip across the city to discuss best practices in learning from one's community to make a more significant impact in it. Presenters will overview an approach taken in learning from the local Spring Hill community, assessing their needs, and working with them to combat a lack of fresh produce with the creation of a community garden. By learning from successes and failures of those involved, students will be better able to analyze what they can do as a Bonner Program and university to make positive change. Non-Violent Communication, developed by Marshall Rosenberg in the 1960s, is an approach focused on language and communication skills that strengthen our ability to remain human, even under trying conditions. It guides us to reframe the way we express ourselves and listen to others by focusing our consciousness on four areas: what we are observing, feeling, needing, and what we are requesting to enrich our lives. Some people use NVC to respond compassionately to themselves, some to create greater depth in their personal relationships, and others to build effective relationships in their work or service efforts. In this session, we will seek to understand the core aspects of NVC and role-play scenarios relevant to your leaderships roles in Bonner. This workshop will address the alarming truth behind incarceration in the United States. Additionally, the workshop will inform people on the struggles, stigmas, and needs of incarcerated communities and how we can serve these communities despite the challenging, and often present, physical barriers. This action-packed thriller is sure to make an impact. Or maybe just show you how to ensure that your Bonner Program is making an impact in your community. Hang out for an hour with two local celebrities from the United Way of Volusia-Flagler Counties and learn about how to measure the impact of your service, increase the capacity of your Bonner Program, and help your service sites grow. In this workshop, we will engage in open dialogue about the importance of drawing a line between a charity-centered approach to community service as opposed to a social-justice approach. Primarily, it is imperative that we begin by establishing a working definition of the word volunteerism to be used as a reference during our conversations and to foster a moment of reflection about our experience, thus far, as Bonner leaders. At the conclusion of this workshop, we should be able to walk away with a deeper understanding of the importance of ethical, social-justice centered community service. The United States leads the world in the amount of foreign aid it gives out all. However, there are right and wrong ways to address a community's needs. In fact, it may be better in some cases to give cash out directly instead of creating aid programs. In this workshop, participants will examine some of the pitfalls of USAID and international charity organizations. Solutions to current issues will be presented, and participants will leave with some ideas on how to take the Bonner Model of engagement worldwide! Come hear how the University of Lynchburg’s Bonner Program does Community Building. This workshop will focus on how to build relationships and promote a safe space, which can lead to more impactful leadership experiences within your Bonner Program. In this workshop, participants will explore the intersection between their personal identities and their work at their volunteer sites. Participants will consider how their personal characteristics and values may create challenges or sociocultural barriers for building trust and meaningful relationships with the populations they interact with in their Bonner work. This workshop will include both personal reflection and an opportunity to collaboratively propose solutions to the challenges identity may cause in volunteer work, in order to engage these differences for the mutual benefit of the community and individual growth. Creating a personal brand experience will help you find and showcase your strengths so you can stand out from the crowd. By tapping into your unique skills, talents, passions, and Bonner experiences you can leap off the pages of your resume and into the top your recruiters’ minds. This workshop will offer you an opportunity to develop a strong elevator pitch that will make a lasting and meaningful impression on whomever you meet. Bonner alumni will lead discussions about crafting an elevator pitch and offer feedback as you refine your own pitch. “Inosculation” is a term describing the phenomenon of when the trunks, branches, or roots of two or more trees grow together. Through the experiences that the Bonner Program provides, our understandings of the relationship between “community” and “service” become inseparably intertwined. The commitments we make to our service sites and our respective programs highlight our beliefs and how they intersect with our shared values. This workshop is designed to explore the relationships between the Bonner common commitments, the responsibilities we have at our sites, and the commitments our sites make to the local community. Powerful advocacy events across college and university campuses are vital to long-term social change goals. How can those conversations and work lead towards the most meaningful impact across our campuses and in the community? In this session, you will learn about an Issue Based Model from Berry College that has promoted social change across a variety of different issue areas that integrates advocacy, service and policy awareness. Participants will also have an opportunity to brainstorm an ideal and sustainable Issue-Based structure. Great leaders aren't great alone. They work with others leaders to achieve a common goal. Unfortunately, this model of leadership isn't always the easiest. Working with other leaders can lend itself to certain challenges and even a "power struggle." Fortunately, there's a cold truth to overcoming these challenges. Get lost in an icy tundra while working with other leaders to discover the importance of diversity in leadership. The University of Houston (UH) Bonner Test Preparation Model offers a framework to other Bonner schools to start their own test preparation program(s). The UH Bonner program has been operating an SAT entrance test preparation program, “Lobo Prep,” for four years with a history of data-driven success. Interested Bonners can learn about Lobo Prep’s tutoring and mentoring model. In a future long-term partnership, UH Bonners will give partner Bonner schools the newest edition of SAT/ACT curriculum, help administer a program, and help schedule their session calendar.